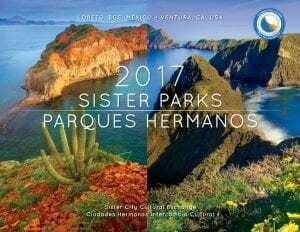 The cover of our Sister Parks 2017 Calendar — a beautiful image of islands in both parks: Isla Danzante in the Bay of Loreto National Park on the left and Santa Cruz Island on the right merged together. The calendar was a joint project between Ventura and Loreto Sister City Committees and designed by Barbara Brown’s former company, BbmdStrategicBranding. Donations to the Disaster Relief Fund have been pouring in from all across the globe. And one of those donations came from Ventura’s own Sister City, Loreto, Baja California Sur, Mexico. Not only are we Sister Cities, we are Sister Missions with Mission San Buenaventura and Our Lady of Loreto Mission, and Sister Parks with the Channel Islands National Park and the Bay of Loreto National Park. Linda, the co-founder and treasurer of Eco-Alianza de Loreto, A.C. (a non-profit conservation organization), informed us of their donation. “Our hearts have been aching for our friends in Ventura, and we wanted to help in some small way,” Linda said. We are so grateful for their kind generosity and support.